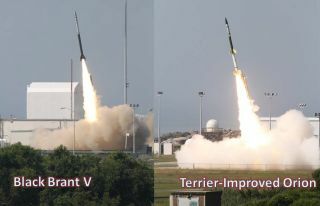 This image from a 2011 rocket launch campaign shows the liftoffs of a Black Brant V and Terrier-Orion sounding rocket. Similar rockets will be used to launch NASA's Dynamo mission to study Earth's ionosphere in July 2013. NASA is hoping to celebrate the Fourth of July with some fireworks if its own today with a double rocket launch from Virginia's Eastern Shore. After a series of weather delays, scientists at NASA's Wallops Flight Facility on Wallops Island, Va., will try to launch two small sounding rockets just 15 seconds apart in an experiment to study electrical currents in Earth's atmosphere. The launches could blast off between 9:30 a.m. EDT and 11:30 a.m. EDT (1330 and 1530 GMT), weather permitting. You can watch NASA's double rocket launch live on SPACE.com here beginning at 9:30 a.m. EDT, courtesy of Wallops officials. Today's planned Fourth of July rocket launches are part of NASA's Dynamo project, a mission to study the global electrical current in the Earth's ionosphere between 30 and 600 miles (48 and 965 kilometers) above the planet's surface. This current, also known as the dynamo, is used every day by people on Earth, NASA officials said. Radio waves are regular bounced of the ionosphere to relay signals around the world. Signals from communications and navigation satellites pass through the ionosphere, but disruptions in the atmospheric layer can distort those signals. The experiment could also help scientists determine if dynamos exist on other planets, too. "The manner in which neutral and ionized gases interact is a fundamental part of nature," the mission's principle investigator Robert Pfaff of NASA's Goddard Space Flight Center in Greenbelt, Md., said in a statement. "There could very well be a dynamo on other planets. Jupiter, Saturn, Uranus and Neptune are all huge planets with huge atmospheres and huge magnetic fields. They could be setting up dynamo currents galore." The Dynamo mission is a joint project by NASA and the Japan Aerospace Exploration Agency to launch two rockets with different instruments to monitor the electrical eddies of the ionosphere. NASA initially attempted to launch the mission on June 24 but cloudy weather prevented the flight. Since then, a series of weather issues due to clouds and high winds have delayed the launches. The larger of the two sounding rockets is a Black Brant V, a 35-foot-long (10 meters) booster that will carry a 600-pound (272 kilograms) payload to measure the neutral and charged particles it encounters in the ionosphere. The smaller booster is a 33-foot (10.6 m) Terrier-Orion sounding rocket and is built to release a long trail of lithium gas in the ionosphere. According to a NASA description, this gas will allow scientists to track wind speed variations in the Earth's atmosphere, a key measurement since the winds are thought to drive the electric dynamo process. For today's daytime launch, Japanese researchers and scientists with Clemson University in South Carolina invented a new technology that uses the lithium trails as a tracer that can be tracked in daylight by cameras equipped with special filters. A NASA aircraft will also monitor the Dynamo experiment from the air to collect more observations above the haze and cloud layers, NASA officials said. Both sounding rockets can reach suborbital space 100 miles (160 km) above Earth, but are not powerful enough to enter orbit. Each flight will last about five minutes from liftoff to re-entry. While NASA will webcast the attempted launches of the Dynamo mission, the liftoffs should also be visible to local observers at the Wallops Flight Facility and its surrounding area. The facility's Visitor Center will be open at 8 a.m. EDT for members of the public. You can find directions to the NASA Visitor Center at Wallops here. Editor's note: If you live near NASA's Wallops Flight Facility and snap a photo of the Dynamo rocket launches that you would like to share for a possible story or image gallery, please send images and comments to managing editor Tariq Malik at spacephotos@space.com.